TRAGEDY has befallen a Zimbabwean family after it was involved in an accident that killed a woman and her 18 months-old daughter, leaving her husband and son hospitalised after they returned home for the holiday from Australia where they are based. Mr Emmanuel Ngoni Mpofu (34) and his son Romero Emmanuel Nicholas (14) survived the accident which killed his Australian wife Ms Penno Elizabeth Claire (32) and daughter Anaishe Elizabeth Mpofu. 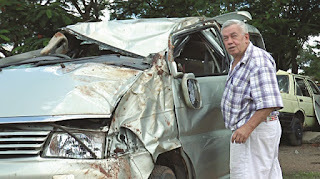 The crash occurred around 6PM near Victoria Falls along the Victoria Falls-Kazungula road on Thursday. Claire and her daughter suffered head injuries and died on the spot. Police said Mr Mpofu failed to control the vehicle resulting in it veering off the road and overturning before it rolled several times. “I can confirm that two people, a woman and her daughter died on the spot at about 6pm on Thursday on the Victoria Falls-Kazungula road,” said police officer commanding Victoria Falls District Chief Superintendent Jairos Chiwona. He said Mr Mpofu was still admitted to Victoria Falls District Hospital yesterday while Romero was treated and discharged. Police suspect that Mr Mpofu, who was driving a Zimbabwean registered Toyota Regius towards Victoria Falls from Kazungula, was speeding. “The driver lost control of the vehicle resulting in it veering off the road and overturning before it rolled several times. Initial investigations show that the driver could have been speeding. We would want to urge motorists to observe road rules,” said Chief Supt Chiwona. Meanwhile, police in Matabeleland North Province have warned members of the public against violent and unruly behaviour during the Christmas Holiday. In a statement, ZRP Matabeleland North provincial spokesperson Inspector Siphiwe Makonese said police will be in full force to prevent criminal activity. She said the province will be receiving thousands of people especially for the iflix Victoria Falls carnival which starts next week Friday hence criminals might want to take advantage of the situation. Insp Makonese said common crimes during this period include burglary, stock theft, theft, mugging, assault and public violence as well as traffic offences. “The province traditionally receives many people this period and we want to urge those visiting to make sure they deal with recognised agents and lodges and not to deal with strangers as they are prone to falling victim,” she said.